Paper presented by Maedeh Tayebi-Khorami at the AusIMM Complex Orebodies conference in Brisbane in November. There is an increasing trend in the extraction and development of copper resources from complex deposits. The complex deposits pose mineral processing challenges, as they often contain low grade copper ore, relatively large quantity of clay minerals, complex texture, very fine disseminated ore, high amount of pyrite, and high level of impurity elements such as arsenic. Arsenic is a naturally occurring element, however its presence in the ore deposit will have production, environmental and human health implications. With the amount of arsenic in concentrates increasing and with environment, occupational health and safety regulations becoming more restrict, there is a need for a processing method that results in no arsenic emissions and captures all arsenic while immobilizing it in a compound that is stable under a wide range of conditions, so it is suitable for long-term disposal. Some development work has been undertaken to examine the most effective arsenic treatment option for complex orebodies that contain arsenic, but a technically robust and economically viable option has not yet been developed. Previous research has demonstrated the possibility of separating arsenic-copper sulphides from other copper minerals by controlling the potential of the flotation pulp in the single mineral systems. The selective flotation of enargite from copper sulphides in a complex ore system is discussed in this paper. A complex ore system was selected which had various levels of arsenic as enargite. Two ore samples with different arsenic levels, HAS (250 ppm) and LAS (100 ppm), were selected to provide a range of arsenic level. Size by size mineralogical analysis was performed by Mineral Liberation Analyser (MLA). The main copper minerals were bornite and chalcopyrite. The major difference between the two samples was the distribution of the gangue minerals. The sulphide gangue mineral was pyrite with practically two times higher in the HAS sample than that for the LAS sample. Gangue mineralogy mainly comprised of quartz, diaspore, and phyllosilicates including muscovite, pyrophyllite, and kaolinite (Tayebi-Khorami et al., 2017a). The selective separation of enargite from non-enargite copper minerals (NECu) in a rougher flotation system under controlled pulp potential was investigated for both samples (FIG 1). It was observed that it is possible to selectively separate enargite from other copper minerals after reducing the pulp potential to about -200 mV SHE at pH 11 in the LAS sample. However, no separation between enargite and NECu minerals was observed at a reducing potential for the HAS sample, and enargite did not float very well for this sample as the Eh was changed. There could be several reasons for different observations between the LAS and the HAS ore samples. One possible reason could be due to differences in ore mineralogy of the tested ore samples. However comparing the mineralogy data of the LAS sample with those for the HAS sample showed a similarity in the liberation characteristics and modal mineralogy of the HAS and the LAS samples. Therefore, this explanation cannot be correct. The other reason for these observations can be due to the change in the flotation conditions for the HAS sample. However each Eh condition was tested several times in order to have a consistency in the results and reduce the experimental error. The other reason for the lower recovery observed from the flotation test on the HAS sample might be due to the different amount of gangue content in the HAS and the LAS sample or the presence of oxidation products on the surface of the enargite particles (Tayebi-Khorami et al., 2017b). The main non-sulphide gangue minerals (NSG) in both samples were quartz, muscovite, pyrophyllite, and kaolinite. The recovery data for different non-sulphide gangue minerals were studies and observed that recoveries of quartz, muscovite, and kaolinite were lower than the water recovery, suggesting that these particles were possibly recovered by entrainment. In contrast, the recovery of pyrophyllite was significantly greater than water recovery which means that this mineral was recovered by true flotation. At Eh -200 mV SHE, the lowest recovery of NSG and water recovery was observed. The recoveries of all non-sulphide gangue minerals increased as the Eh increased toward more oxidation conditions. At Eh +400 mV SHE the highest amount of recovery of NSG was observed. Comparison of the liberation characteristics of pyrophyllite recovered in the concentrates of the HAS and the LAS at different Eh conditions showed that the particles recovered to the concentrate were mostly liberated. Analysis of the results indicated that there was not sufficient evidence to allow statistically valid conclusions to be drawn on the effect of gangue minerals. Further work is required in terms of surface studies by SEM, XPS, etc (Tayebi-Khorami et al., 2018a). Surface chemistry studies were undertaken using an EDTA extraction technique for both the HAS and the LAS samples to evaluate the amount and type of metal ions on the mineral surface and the possible reasons for different flotation results. EDTA extraction of copper and arsenic showed higher metal oxidation in the HAS sample compared to those in the LAS sample. It was also observed that Enargite had the lowest rest potential compared to other main sulphide minerals present in both HAS and LAS samples. It was concluded that the oxidation of enargite in the HAS sample due to galvanic interactions with pyrite caused its poor floatability and consequently poor selectivity from other copper minerals (Tayebi-Khorami et al., 2018b). · A desliming stage prior to the flotation process, where fine fraction −11 μm can be separated from the ground flotation feed, followed by a fines treatment stage, where enargite and any remaining NECu minerals can be separated from the fine no-sulphide gangue minerals. 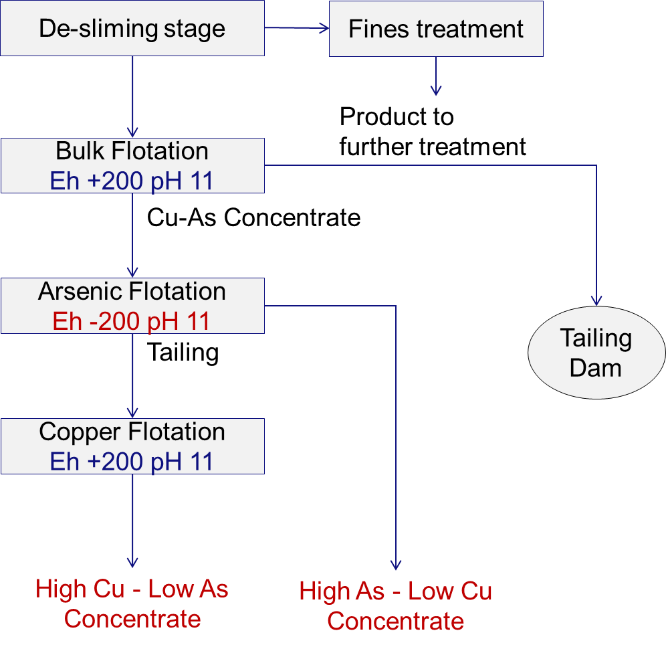 · A bulk copper-arsenic flotation stage at air set potential to produce a high arsenic-high copper concentrate. · Arsenic flotation at −200 mV SHE, under nitrogen gas, to selectively depress the NECu and float the enargite to produce a high arsenic-low copper concentrate that would be further treated using other techniques like hydrometallurgy. Further process development and economic modelling is required to better define the selective flotation process that may be incorporated into the project with the required level of confidence. The author would like to thank the support from Ausenco, JKMRC/UQ, and CSIRO Minerals. Author would also like to acknowledge the following people who provided guidance and support for the original thesis published by the University of Queensland: Prof. Emmanuel Manlapig, Dr Liza Forbes, Dr Mansour Edraki, Prof Dee Bradshaw.